Today I found out why the toilet is also often called “The Crapper”. It all started with U.S. soldiers stationed in England during WWI. The toilets in England at the time were predominately made by the company “Thomas Crapper & Co Ltd”, with the company’s name appearing on the toilets. The soldiers took to calling toilets “The Crapper” and brought that slang term for the toilet back with them to the United States. Interestingly, the word “crap” does not derive from “Crapper”. The origins of the word “crap” is not entirely known, but it is known that it was commonly used in England to refer to rubbish or chaff, but fell out of use in the 16th century, long before Thomas Crapper and his company came along. The term “crap” was still used somewhat in America though, coming over pre-16th century from England, and it is thought that one of the reasons American soldiers seemed to universally take to calling the toilet “The Crapper” is they found it funny with “crap” meaning something to the effect of “refuse” and that most of the cisterns and toilets in England were stamped with “T. Crapper & Co Ltd”. It was ironical to them, though the joke was lost on the English who had long stopped using the term “crap”. The founder of the company, Thomas Crapper (born around 1836 and died 1910), himself was a famous plumber. At least as famous as plumbers can be; he was the official plumber of a few of the royal family of the day and owned one of the larger plumbing companies in England at the time. January 27th is officially Thomas Crapper day. Among his accomplishments, he holds eight patents in the plumbing field including inventing such things as the “ballcock”, which is the float-triggered flushing mechanism in your toilet. Thomas Crapper is also often cited as being the one to invent the toilet, but this is not correct. The toilet was invented a couple hundred years before Mr. Crapper by John Harrington in 1596. Although, it wasn’t until 1778 that the first practical toilet was invented in England, by Joseph Bramah. 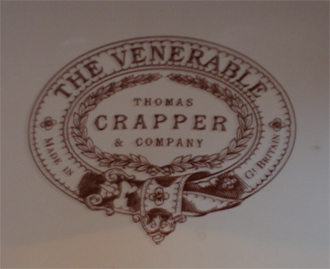 Thomas Crapper’s company is still around today and their official website can be found here. The manhole covers with Crapper’s company name on them in Westminster Abbey are now even minor tourist attractions for some reason. “What did you do on your vacation?”…”I toured London looking at Crappers”. Interestingly, in Zimbabwe they also call the toilet “the shanks” after the toilet brand armitage shanks. Looks like it’s a trend. I was informed that the origin of crap and the original crapper, was the person who collected used stable bedding from the back yards of houses in old England.